Most of the people around you who proclaim themselves to be all knowing Batman fans, seem to know next to nothing about Batman. Start a conversation about "Batman- Year One" and they look blank. Ask them about what they thought of Tim Burton's Batman and they'll look through you. TKDR to them is "The Dark Knight Rises" not the Frank Miller's classic. No one seems to know Kevin Conroy. Then, there are some who go around calling themselves 'Batman' and want to be referred to as 'Batman'. I kid you not. Anyway, Batman has gotten popular - thanks to Nolan - and I think that's great! Christopher Nolan is the first director to have directed a Batman trilogy and he's done a fantastic job of finally portraying Batman and Gotham as it is supposed to be portrayed. DARK. "Batman Begins" (inspired by "Batman - Year One" in my opinion the best graphic novel ever) was fantastic! "The Dark Knight" was legendary. 'Joker' just killed it! Nolan and Heath Ledger got the menace just right. With references to 'Year One' and 'The killing joke', it was perfection in itself. "The Dark Knight Rises" is good, but not great. Final verdict: This is watchable for Anne Hathaway as Selina Kyle, for tying the loose ends on the Batman Trilogy neatly and for Batman. Is it "The Dark Knight"? No. Is it better than 'The Avengers?' Yes. So, what happened with "The Dark Knight Rises"? What went wrong? Loads of things. Setting up the plot took too much time. When I heard that Bane would be the villain, I was excited. 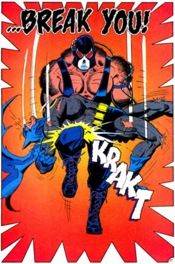 The most unforgettable comic panel from 'Knightfall' was about to be portrayed on screen. What it turned out to be was - a 2 second scene. Disappointed. So the storyline was a mix of 'Knightfall' and 'The Dark Knight Returns', fine. There was a bit of 'Bruce Lee' in the way the back broken hero heals himself. Great! But overall the movie left me very very disappointed. It was good, but not the crescendo one expected of the final of the trilogy. Too many threads that did not make any sense - Why show Doctor Crane as the judge presiding over a Kangaroo court? What's with the cops stuck underground for 3 months part? What's the entire orphanage bus on the bridge scene? The movie could have been so much more slick and so much cooler. But it was Bane taking on Joker. Impossible.